"Plain English has succeeded nicely with this app... it's easy to deploy, easy to use. And it's only gotten better since its first release. I've sold it to clients before it was released officially, and they love it." Do you pine for the days of yore, when it was possible to print a label on your Dymo® LabelWriter™ directly from within GoldMine with a single mouse click? Well, rejoice my friends, those days are back! Dime-O-Gold (not DymoGold!) comes in 2 flavors: Express and Pro. Express = lower-priced, basic functionality... Pro = cost more, but delivers more. Dime-O-Gold Express ($69.95) does a great job printing labels from GoldMine with a single button-click, but only prints labels for the current Primary contact. 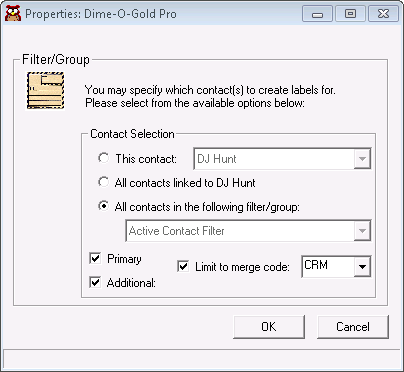 Dime-O-Gold Pro (price varies with GoldMine user count) also gives you the ability to print labels for "Additional" contacts, as well as batches (filter/groups/tagged) of contacts all at once. One-button label printing from GoldMine. History logged to the contact record automatically (or interactively). a. Address2 is short (i.e. less than 12 characters). b. Address1 + Address2 is short (i.e. less than 60 characters). User's own country programatically suppressed. Any field(s) may be suppressed from printing. User-selectable order for main fields, i.e. Contact, Title, Company vs. Company, Dept., etc. Prints labels for filter, group, or tagged records. Primary Contacts, Additional Contacts, or Both. Limit by Merge Code (option). Can use command-line switch to run in "Express Mode." Preview/Adjust list prior to printing. Familiar graphical user interface for contact selection (see below). Prevents label from printing if critical data (i.e. zip code) is missing. "I have downloaded and installed on my system. It works great. If you need to print to a Dymo printer, this is the tool for you!" GoldMine Software: Tested with GoldMine 2014.1, but... should work with nearly any version of GoldMine 6.0 or later. Be sure to try before you buy. GoldMine must be operational on the machine you plan to print labels from. Prerequisite: You must have already purchased, installed, and successfully tested your Dymo LabelWriter. Dime-O-Gold is the link between GoldMine and Dymo. If the Dymo doesn't print on its own, it won't print with GoldMine! Dime-O-Gold Express. One-button-click prints your label and logs to History. Single, primary contact only, i.e. no filter/group, no Additional Contacts. $69.95 per company, unlimited users.